Desalination of seawater is an emerging solution to California’s fresh water scarcity. Communities along California’s coastline have expressed concerns for the well-being of coastal aquatic ecosystems surrounding desalination plants. Is the desalination process harmful to these ecosystems? Are there safer alternatives to obtaining fresh water? Figure 1. A view of the reverse osmosis system within a desalination plant. Photograph by James Grellier, 2010. CC BY-SA 3.0. Worldwide, fresh water has become increasingly scarce due to global climate change, rising demand, and diminishing local water sources. 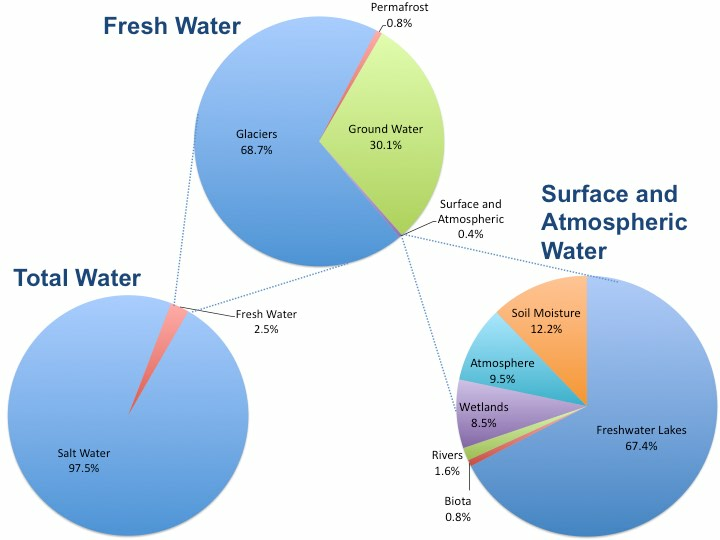 Although the earth consists of about 71% water, only about 1% of that water is drinkable1 (Figure 2). To sustain growing populations, humanity must be able to fully utilize this abundant resource. Desalination of seawater is one solution that has been proposed to coastal areas, which are inhabited by 50% of the human population. While this option could increase the amount of available fresh water, it may also create problems for the surrounding ecosystems and organisms living within. California plans to build a multitude of desalination plants along its coastline. However, scientists are actively researching the effects, costs, and benefits of these water treatment facilities. Figure 2. While earth consists of about 71% water, much of that water is non-potable or is inaccessible to humans. Courtesy of Brian Lower. Data from Shiklomanov, 1993. Public Domain. The desalination process involves taking seawater and forcing it through reverse osmosis membranes to clean it (Figure 1 and 3). This process can negatively impact community land use, increase erosion, cause visual and acoustic disturbances, and spread emissions into the water and atmosphere.2 Coastal ecosystems around desalination plants are being threatened by large decreases in primary and secondary consumers as well as the destruction of their fragile environment. When a desalination plant is taking in seawater it also draws in numerous species of aquatic life. The screens contained within the plants will kill these vital microorganisms, which are needed for consumption by larger species.3 A commission staff residing in San Diego estimates that the desalination plants will intake more than 80 million fish larvae, eggs, and invertebrates annually along the 160 kilometers (100 miles) of the Southern California coast.1 These desalination plants cause severe harm to coastal ecosystems, especially considering that the plants are drawing in seawater that is part of the National Marine Sanctuary (Figure 4). Figure 3. Reverse osmosis is one technique used to transform salt water into fresh water. Image by Colby Fisher, 2013. CC BY-SA 3.0. Figure 4. 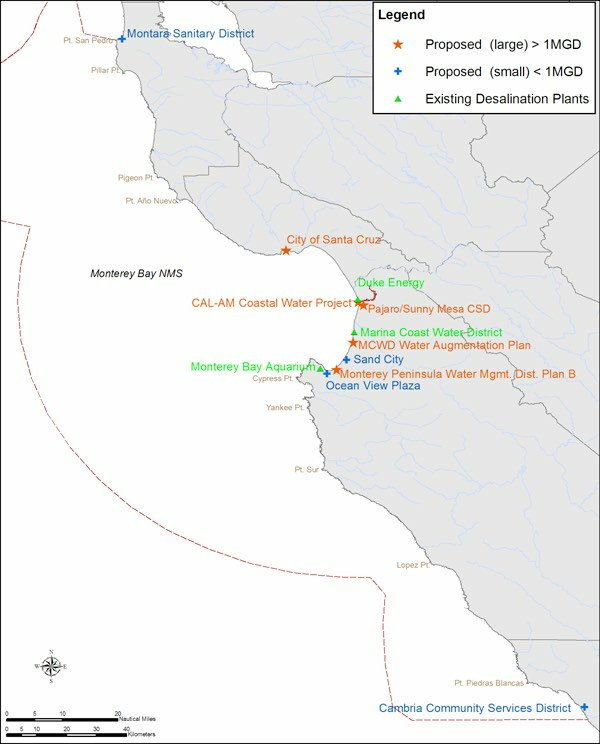 Map of Existing and Proposed Desalination Plants in the Monterey Bay National Marine Sanctuary. National Marine Sanctuaries are meant to protect coastal ecosystems from industrial harm. However, desalination plants negatively impact these protected areas. Courtesy of NOAA, 2015. Public Domain. Many environmental factors can reduce the effectiveness of the desalination process. Algal biomass and other organic loads can negatively affect the desalination operation within the pretreatment system, and may force a plant to shut down.6 Harmful algal blooms may have two potential impacts on seawater desalination facilities. First, the toxins produced by these algal blooms can complicate the reverse osmosis system and cause the water to only be partially cleaned. Second, the suspended solids and organic content from the algal blooms can increase turbidity and delay the facility’s treatment process.7 Changes in weather and temperature are important when considering installing desalination plants. Desalination plants are becoming larger not only due to growing populations, but also because of changes in climate and geography. Coastal ecosystems, especially coral reefs, are highly sensitivity and are expected to change seasonally in upcoming years. During certain seasons the seawater contains nutrients, plankton, and suspended solids that are not suitable for intake into desalination plants.8 Additionally, seawater level variation could result in unpredictable changes in absorption and efficiency. According to a report by the U.S. Geological Survey, California will be experiencing more frequent and intense droughts along with flash flooding in the near future.9 Desalination plants contribute to these climate change related factors by emission of carbon and sulfur dioxides. There are alternatives to desalination, such as multi-stage flash distillation and multiple-effect distillation. Currently, neither of these distillation techniques is less harmful, or more productive than conventional desalination.2 Due to scattered application and limited public attention, the true environmental impacts of desalination are unknown. Although desalination plants may be an effective solution to California’s need for an increased supply of fresh water, the lingering effects of this treatment process may be detrimental to the coastal environment. The beauty of California’s coastline is indispensable for many communities and cannot be compromised to establish a single solution for fresh water scarcity. Kipps, J. (1991). IDA World Conference on Desalination and Water Reuse, Washington. 1: 1-9. Ebensperger, U. & Isley, P. (2005). Review of the Current State of Desalination. 1: 1-20. Khawaji, A.D., et al. (2008, March). Desalination. 221(1-3): 47-69. Petry, M. et al. (2007). Desalination. 203(1–3):141–152. Caron, D., & Garneau, M.E. (2010). Water Research. 44(2):385-416. Hopner, T. & Windelberg, J. (1997). Desalination. 103(1-3): 11-18. Grellier, James. (2010). 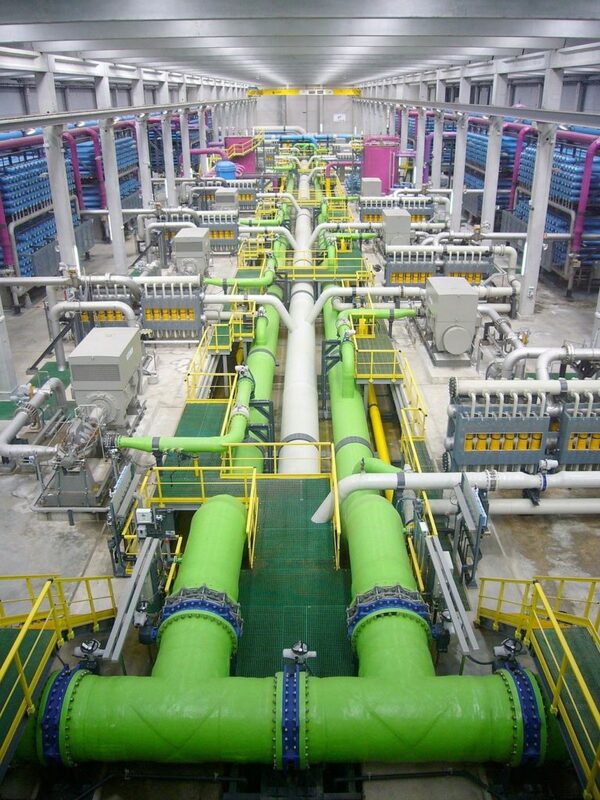 Reverse osmosis desalination plant. [Photograph]. Retrieved from Wikimedia Commons. CC BY-SA 3.0. Lower, B.H. (2015). Introduction to Environmental Science: Freshwater Resources. [Powerpoint slides]. Retrieved from http://go.osu.edu/enr2100. Shiklomanov, I.A., (1993). World fresh water resources. 13-24. Gleick, P.H. (Ed. ), Water in Crisis: A Guide to the World’s Fresh Water Resources. Oxford University Press, New York. Fisher, Colby. (2013). Simple RO Schematic. [Diagram]. Retrieved from Wikimedia Commons. CC BY-SA 3.0. National Ocean Service. (2015). Monterey Bay National Marine Sanctuary Desalination Map. [Diagram]. Retrieved from http://montereybay.noaa.gov/materials/mappages/desalinizationmap.html. © National Oceanic and Atmospheric Administration. Public Domain.